Will Chelsea Secure a Spot in The UCL on Wednesday or Will the Spurs Surprise and Mix Things up at the Top of the Tables? 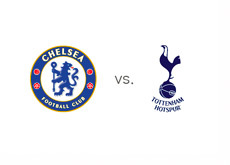 The Chelsea vs. Tottenham match this coming Wednesday at Stamford Bridge is one of the biggest matches remaining in the English Premier League this season. Both teams are fighting for a spot that leads to the UEFA Champions League (UCL) and with three games left to play, this is a BIG one. Chelsea are in 3rd place with 68 points, Tottenham are in 5th with 65 and in-between them is Arsenal with 67 points, but with one game less to play until the end of the season. A win at Stamford Bridge for Chelsea secures them a top four finish and a spot in the UCL (because of the large goal differential compared to Tottenham), while a tie or a win for the hosts further complicate things. Undefeated in the last six games, Chelsea are in great form these days. Most recently they beat Manchester United 0-1 at Old Trafford and just before that they qualified to the UEFA Europa League finals by eliminating FC Basel 5-2 on aggregate. Tottenham are also having a good end to the season. They are undefeated in the last seven games, not counting the penalty shoot-out loss to FC Basel in the UEFA Europa League quarter-finals. Most recently Tottenham beat Southampton 1-0 at home, tied Wigan 2-2 away and beat Manchester City 3-1 at home. This is going to be a great match. Andre Villas-Boas, who coached Chelsea last season, will be making his first visit back to Stamford Bridge with the Spurs. Earlier this season Chelsea beat Tottenham in London 2-4. Chelsea are clear favourites to win at home and a $100 bet on the hosts returns $100 in profit, while the same bet on Tottenham returns $290 in profit. Demba Ba and Fernando Torres are the favourites to score for Chelsea at 13/10 and 6/4 respectively, while Gareth Bale and Jermain Defoe are the favourites to score for Tottenham at 6/4 and 7/4. Can AVB and Tottenham surprise in London and mix things up at the top of the tables or will it be all Chelsea securing their spot in the UCL next season.